Of course, we’ve already discussed the National Drowning Prevention Alliance’s “layers of protection,” and now it’s time for us to explore touch supervision and the role of the designated water watcher. Drowning is silent. As a swim instructor with over eight years of experience, I can’t tell you how many times parents have told me about the close calls they’ve had in the family pool. It happens all the time! You look down to answer a text, or turn your head to talk to a friend, and in just a few seconds, your little one could be struggling under water without a sound. After about four minutes, permanent brain damage occurs, and death can occur as soon as four to six minutes. Never leave your child’s side around water. To keep your kids safe at all times, you must practice touch supervision. This means you should be only an arm’s length away from your children at all times, around any open water. (That means pools, lakes, bathtubs, etc.) After all, if your kid slips under the water, the fastest way to get them out is to grab them! Please, take a look at the video below. Even though the infant is wearing a life jacket, he could have drowned without the immediate help from his dad. Whether you are at home, a family barbecue or a friend’s pool, it’s vitally important to have a designated water watcher. This person needs to constantly have their eyes on the children in the water. Give them a wristband with a whistle on it, like this one. If they need to take a break, be absolutely certain to pass the whistle and the duty to another vigilant person who knows exactly what he or she needs to do! The Mesa Fire and Medical Department made an informative video of what it means to be a designated water watcher. Check it out, and be sure to embrace the steps they outline. Although the thumbnail depicts a child in floaties, the video clearly states that wearing floaties is an unsafe practice, as it provides the child with a false sense of confidence. Do you have a testimony of how touch supervision or a designated water watcher saved your child’s life? Please leave a comment below. Sarah has been an instructor with us for over eight years. 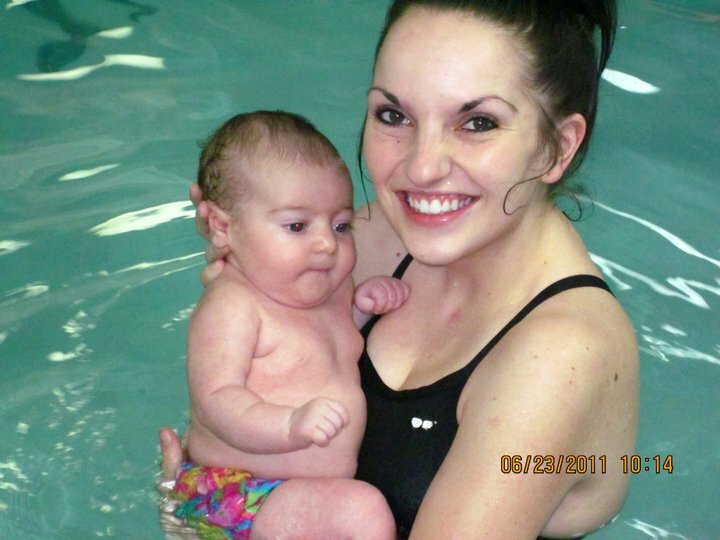 This is a photo from her daughter’s first swim lesson! Unfortunately, we’re off to a rough start with drowning incidents this year. A pool is 100 times more likely to kill a child than a gun. According to City of Phoenix statistics, there have been 13 drowning incidents, which resulted in four fatalities– two adults and two children. It’s vitally important to watch your children around water. That means not only around pools, but also buckets and bathtubs. Simply covering your pool is not enough, as was sadly proven when two twin girls drowned on top of a pool cover that had filled with rain. Supervise at all times. It’s obvious that you need to constantly watch your kids around water to keep them safe. However, you need to supervise them even when you aren’t participating in aquatic activities. Always know where your children are, and always be aware of potential dangers in unfamiliar environments- such as a friend’s house. If you can’t locate your little one, always check the pool or spa first. See the video above for a more in-depth explanation. Install physical layers limiting access to pool areas. This means putting a fence around your yard, and enclosing your pool. The pool enclosure should have a self-latching gate that latches at least 54″ above the ground, preferably with a lock. Make a rule to never, under any circumstances, prop open the gate for any reason. Be sure to place all patio furniture, garden items and play structures at least 4 feet from the wall to prevent climbing over the fence. Additionally, place a cover over your pool. Invest in an alarm system. Doors and windows with access to the pool area should have alarms to warn adults about potential outside activity. Water (surface and subsurface) alarms can be placed in the pool, and they will alert you when the water has been disturbed. In addition, install a lock that is out of reach of children on the doorway leading to the pool. Learn CPR and rescue breathing. Mere seconds can mean the difference between life and death. Here at SWIMkids USA, we offer community CPR certification so you can equip yourself with the knowledge and skills needed to save someone’s life. Enroll in swim lessons. Everyone should know how to swim! And once your kids begin to learn, don’t stop. In order to retain swimming ability, you have to use it. We hope this short guide helps you understand that we need to practice layers of protection all year long! Please keep your kids safe around water, and help us make this Arizona’s safest year yet.